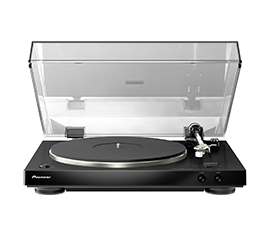 The Pioneer PL-30-K turntable allows seasoned vinyl lovers to upgrade their existing phono system, while new-generation music listeners can explore the thrill of collecting and engage with music in a way unique to the vinyl experience. The PL-30-K turntable delivers so much value, because it comes equipped with a high-performance, high-output moving magnet (MM) stereo phono cartridge, pre-mounted and ready to play. And because the PL-30-K is equipped with a built-in phono equalizer and On/Through selector, it’s the perfect turntable for systems that use a preamp, integrated amp or receiver without a built-in phono stage. Just plug the PL-30-K into an auxiliary RCA input, select “On” and play.